When you purchase a newly built home, the builder usually offers some sort of full or limited warranty on things such as the quality of design, materials, and workmanship. These warranties are usually for a period of one-year from the purchase of the home. At closing, the builder will assign to you the manufacturer’s warranties that were provided to the builder for materials, appliances, fixtures, etc. For example, if your dishwasher were to become faulty within one year from the purchase of your newly built home, you would call the manufacturer of the dishwasher – not the builder. If the homebuilder does not offer a warranty, BE SURE TO ASK WHY! When you purchase a resale home, you can purchase warranties that will protect you against most ordinary flaws and breakdowns for at least the first year of occupancy. The warranty may be offered by either the Seller, as part of the overall package, or by the agent. Even with a warranty, you should have the home carefully inspected before you purchase it. A home warranty program will give you peace of mind, knowing that the major covered components in your home will be repaired if necessary. Ask me for more details about home warranty packages. 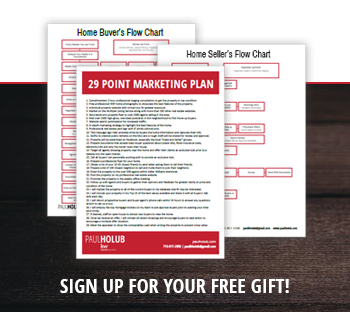 Get our 29 point marketing plan and complete seller's and buyer's flow charts! Sign up for updates and we'll send you immediate access as a free gift. © 2019 The Holub Team | All Rights Reserved.